His Divine Holiness Acharya Swamishree arrived in Surat on Monday 9th February 2009. Shree Muktajeevan Pipe Band London greeted Acharya Swamishree at the grand entrance to the site of the Murti Pratishtha Mahotsav, adjacent to Shree Swaminarayan Temple Surat. Upon his arrival to the site, Acharya Swamishree was honoured by Sant Shiromani Shree Bhagwatswarupdasji Swami (Project Manager for the Surat Temple) with flower garlands. 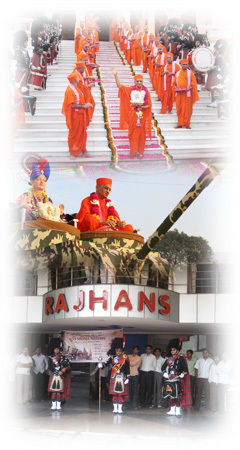 The Band led Acharya Swamishree, who was seated on a military-style tank, and sants to the grand Temple. At the foot of the Temple, Sant Shiromani Shree Divyacharandasji Swami (Chief Engineer and Principal Architect) honoured Acharya Swamishree with flower garlands. Acharya Swamishree then proceeded to the summit of Temple while being serenaded with flower petals by Shree Muktjaeevan Swamibapa’s sants, who lined the steps. Inside the Temple, Acharya Swamishree, enthroned on His Gadi, was honoured and garlanded by representatives of Shree Swaminarayan Gadi Sansthan Temples from around the world, and then retired to His quarters.